Saint Dorothy was born in 1549, in the prosperous early part of the reign of Ivan IV (the Terrible), and died in 1629 during the peaceful reign of the first Romanov Tsar, Michael Theodorovich; but her whole life, beginning when she was twelve years old, passed in the midst of the most frightful conditions of rebellion, anarchy, famine, plague, and foreign invasion. This holy nun of the latter times was of noble blood, and some say that she was of the family of the Princes Korkodinov, but neither her place of birth nor her name before receiving the monastic tonsure are known to us. She was given in marriage to Theodore Ladygin and by him had a son, Michael; they lived in the region north of Moscow, where the city of Kashin is located. In the first decade of the 17th century, Kashin was laid waste by invading Poles and Lithuanians, and St. Dorothy's husband fell on the field of battle in defence of the city. Thus it was that, having lost her husband and her earthly happiness in the midst of the terrible misfortunes of the Russian land, St. Dorothy, already a woman of mature years, resolved to abandon the world and seek, in prayers and struggles, not a temporary happiness which is so often darkened by various evils, but rather a heavenly and eternal blessedness. By Divine inspiration she chose for herself a peaceful and soul-saving refuge in the Convent of the Meeting of the Lord in Kashin. This monastery, renowned for treasuring the holy relics of St. Anna of Kashin, the Princess Schema-nun and miracle-worker (†1368, Oct. 2 and June 12), had just been laid waste together with the city, and how many labors and deprivations and struggles stood before her when she entered it! With great effort she made for herself a humble, confining cell in the midst of the ruins, and here she devoted herself to prayer, fasting, obedience, and other holy struggles known to God alone. Here amidst the ashes she found a large Icon of the Korsun Mother of God, which she kept in her cell, and which later became celebrated for working many miracles. The whole territory where this peaceful hamlet once lay presented itself as a virtual wilderness of dark forests, endless birch-groves and desolate lakes and ponds abundant with birds and freely-roaming wild animals. This was also the native country of highly-esteemed desert-dwelling saints whom St. Dorothy could not but hold very dear to her heart; for she did not retreat, to console her old age, to one of the well-established convents which abounded at that time in Moscow, bit chose the silence of the Kashin wilds, for which she had been preparing her whole life long. Just eight miles from Kashin had lived St. Macarius of Kolyazin (+1483), who had the custom to roam the woods like a new Adam amidst wild beasts who walked with him like sheep. His nephew, St. Paisius of Uglich (1504), joined him as a boy and reached such heights that the Most Holy Mother of God visited him when he was at prayer with his disciple St. Adrian and St. Cassian (1504), the friend of St. Nilus of Sora. Not far away also was Soliger Lake with St. Nilus (1554) living in it on Stolbensk islet. Another native of Kashin, St. Sabbas of Vyshera (1460), having returned from Mt. Athos, became a stylite. All these angel-like men founded monasteries, and the fragrance of their life spread far and wide and inspired ascetic exploits. All this constituted St. Dorothy's spiritual inheritance in her melancholy abode and raised her mind to higher visions and thoughts divine. At the same time she strove to help all the many inhabitants of the city and the surrounding area, who lived in great affliction and misfortune. By her word of consolation, by her heartfelt kindness, and by gifts of money, she strove to help everyone and encourage and raise up all those who suffered in this most oppressive time. All the possessions remaining to her after the death of her husband she either spent for the restoration of the convent or distributed to the poor. For herself she kept nothing except prayer, tears, and struggles. Having been accustomed to live amidst wealth and abundance, now she did not even know where to find her daily bread, and she had to endure every kind of deprivation and need. But with God's help she endured everything with greatness of soul and with firm faith in Divine Providence. In her small, one-windowed cell she had a place hidden from the eyes of men, where she wept, prayed, and sighed before the Lord God day and night over her own salvation and that of her fellow men. Especially did she pray for her husband, for the suffering city, and the holy convent. She sought one thing: the most difficult and sorrowful struggles, in order to cleanse her soul of sins and prepare herself for blessed eternity. The Lord heard the fervent prayer of St. Dorothy for the restoration of the Convent of the Meeting of the Lord. Soon after she had settled in the ruins, they began to resound with the spiritual rejoicing of the sisters, who little by little returned to the convent when the danger had passed. The rumor of the exalted spiritual life of St. Dorothy and her deeds of mercy attracted to the convent also many other virgins and women who were seeking the salvation of their souls. Thus the monastery was re-established, and when enough sisters had gathered together, an abbess was needed for them. But St. Dorothy, who by her numberless labors and struggles and gifts had been responsible for the restoration of the monastery, hated all glory and outward honors, and in her great humility she decisively refused the high position of abbess, preferring to continue her ascetic life in the calling of a simple nun. Thus, for the rest of her life the Saint served for all as an example of love of labor, patience, self-sacrifice, and naming love for and trust in God. Her whole life exhaled the fragrance of the great women-strugglers of Christian antiquity, and likewise of those who preceded her in her native land: St. Anna of Kashin, St. Euphrosyne, the great foundress of convents and monasteries in Polotsk (+1173, May 23), St. Febronia of Murom (+1228, June 25), St. Euphrosyne (+1250, Sept. 25), the great virgin-ascetic of Suzdal, daughter of St. Michael of Chernigov, and others. Such a life did this holy woman live almost in our own days. For it is not the times that are at fault if we do not see now the abundance of holy men and women who flourished in earlier centuries; it is rather our evil will, and lack of determination, and want of faith. But Jesus Christ is the same yesterday, and today, and forever (Heb. 13:8). In the year 1615 St. Dorothy received the Great Angelic Schema and redoubled her labors of asceticism and piety. Finally, after twenty years of struggles in the Convent of the Meeting of the Lord, the holy Dorothy came to the end of her much-suffering life, in the eightieth year of her age. On the eve of the feast of the great and holy inspirer of monastic struggles in the Russian North, St. Sergius of Radonezh, on September 24, 1629, St. Dorothy peacefully reposed in the Lord. From that day she has stood before the Lord with the burning lamp of flaming love for God, and with the oil of good deeds done for her neighbor and of the grace of the All-Holy Spirit which she acquired by her holy life. She passed over from death unto the life prepared for all who love God, from an earthly into a heavenly habitation, where she has yet greater boldness of intercession before the Almighty. The holy remains of St. Dorothy were buried near the main convent church of the Meeting of the Lord, on the north side. Over the grave a memorial of white stone was erected with pillars carved out of it, and the inscription on this memorial survived in almost perfect condition until the 20th century. St. Dorothy remained in spirit with her monastery even after her repose. Her memory was kept sacredly by the sisters down to our own times. Many have been the miracles of healing and supernatural help worked at her grave for those who have come with faith in her intercession before God. A list of these miracles was kept in the monastery. But her memory became especially revered over two centuries after her repose because of her appearances to Abbess Antonia of the Saint's convent. ABBESS ANTONIA MEZENTSOVA (†1875, Jan. 26) was truly a saint. 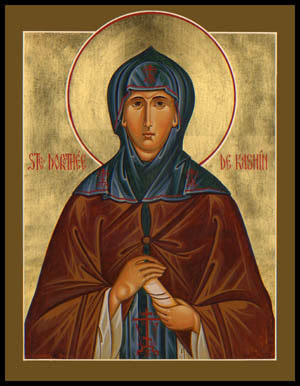 A spiritual daughter of the great 19th-century saint, Priest Peter of Uglch, she was so penetrated with true Orthodox monastic spirit that St. Anna of Kashin would appear to her and tell who of the sisters ought to be tonsured into the great schema and even where the ancient schemas were to be found. But then, after tearful prayer at night, she saw in a dream that she was entering the Convent of the Meeting in Kashin, which she had not seen before; but by reason of the great crowds of people she could not enter the monastery. After many efforts she finally entered, and being astonished at the great numbers of pilgrims, she asked the reason for this; she was told that the relics of St. Dorothy (of whom she had never heard) were being opened for her canonization. This vision cut short the grief of the future Abbess Antonia and gave her the assurance that there was a righteous one reposing in the Convent of the Meeting also, and that her transferal there in 1839 was not without the will of God. After some years in the Convent, the novice Alexandra (as she was then called) entered a particularly difficult period of spiritual trials. One day in this period, when she had not slept for several nights out of sorrow, she went to the monastery church for Matins, and after sitting down for the reading of the kathismata, she fell into a light sleep. Suddenly an unknown Schema-nun stood before her after coming out of the northern door of the Altar. She held in her right hand a wooden cross and a lighted wax candle, and in her left hand a smoking censer. Her mantle was gathered up and hung over her left arm. She stood right in front of novice Alexandra and directed a penetrating glance at her, as if seeing through her inward grief. Immediately the novice arose, but the vision had already vanished, and no one around her had seen it; and in her heart she felt an indescribably joyful feeling, as if she had never been in a sorrowful state. When she returned to her cell after Matins, she hastened to sketch with a pencil on paper the Schema-nun she had seen, whom she recognized as St. Dorothy, whom she deeply revered and often called upon in prayer. Several years after this she painted the Icon of St. Dorothy in full stature, exactly as she had sketched it that morning under the impression of that wonderful vision, only adding the Kashin Convent churches and other buildings behind the figure of St. Dorothy. Later Mother Antonia became Abbess in the Convent of St. Dorothy, and out of her reverence for the saint she desired to show some special veneration for her memory. Many times, when visiting her holy Elder, Father Peter the fool for Christ's sake of Uglich, she would hear from him these words of reproach: "Dorothy is not honored among you!" This greatly grieved Mother Antonia, and finally she asked the Elder what she should do to venerate the holy one. He replied sharply and decisively: "Build a chapel!" In obedience to her holy Elder, she had a small chapel erected out of sheets of metal in a single morning in the summer of 1857,fearing that someone might tell the local bishop and he might forbid the construction if it were long underway. The bishop, however, when he found out about it, approved this veneration of St. Dorothy, and in 1870 Abbess Antonia was able to build a larger, stone chapel over the Saint's relics. During these years St. Dorothy appeared many times and worked many miracles in her convent. A certain nun, Mother Seraphima, loved to spend the midnight hours with her cell attendant in the convent church. One night they came to the church at midnight and to their amazement saw a strange nun praying by a window, even though the church had been locked and no one could have entered. Another time at midnight they saw in the church an extraordinary light, all the candles were burning, and a nun was praying before the Altar. Many other sisters also were vouchsafed such visions of St. Dorothy. To thee O Mother, was truly preserved what is according to the image of God;* for, having taken up thy cross, thou didst follow after Christ,* and thou didst teach in act to despise the flesh, for it passeth away,* but to be diligent over the soul, as a thing immortal. * Wherefore thy spirit, O St. Dorothy,' doth rejoice together with the Angels. From The Northern Thebaid, St. Herman of Alaska Brotherhood, 1995.